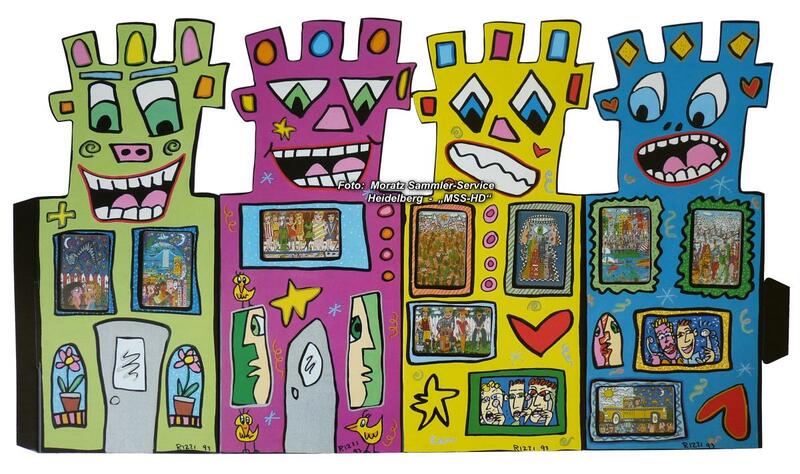 A unique Rizzi work in this form, 1993. The Rizzi Tower consists of a firm cardboard, which is divided into four segments. Each segment (approx. 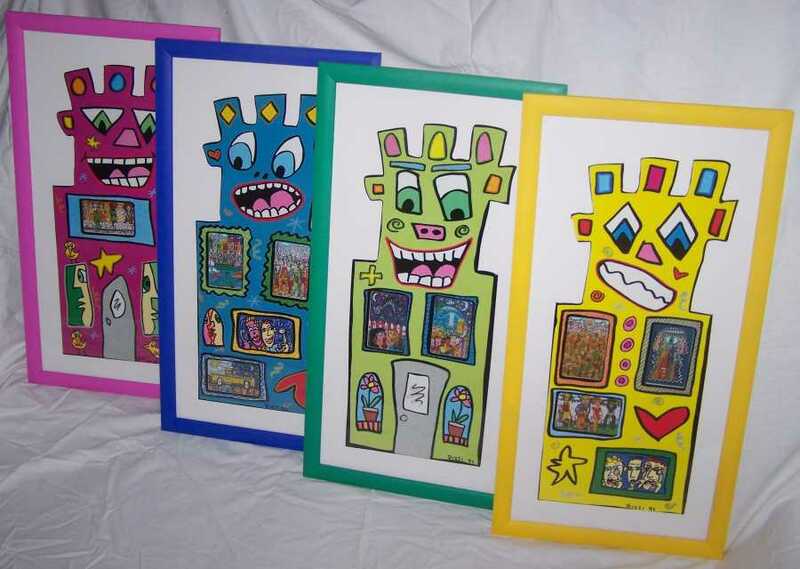 20.5 x 50 cm) with another basis color represents a house front in the typical Rizzi style. In punched out windows are the nine German calling cards, which appeared in November 1993 with selected Rizzi pictures. 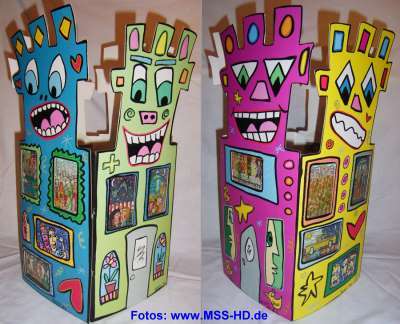 High-quality printed on cardboard paper. Width approx. 82 cm (opened unfold, without lateral latches), height of approx. 50 cm. 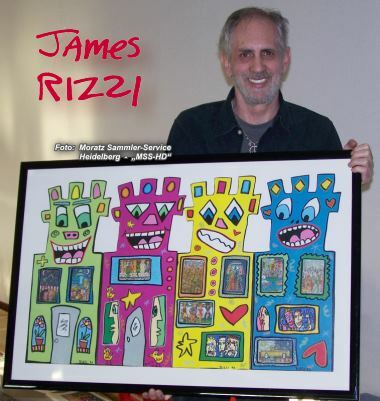 The calling cards have an edition of only 5,000 pieces each. Of the Tower itself, only about 1,500 pieces exist. The expenditure for production and subsequent treatment in manual work was high. The calling cards are therefore offered usually only separately. The contained calling cards are unused (mint condtion) and loaded with 6.00 DM (German Mark) each. The cards in the windows are in soft maker free protection foils. 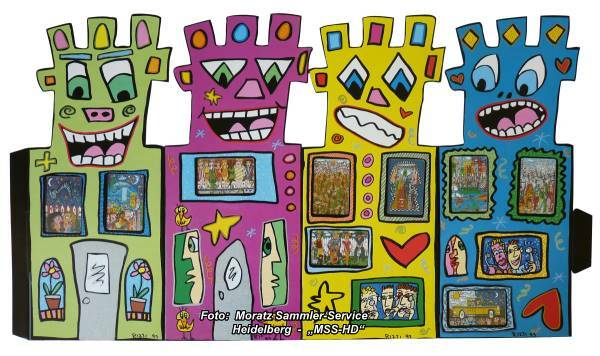 The subjects on the calling cards are existing also all as original 3D constructions (see our offer of the individual cards). A part of the edition of the calling cards was later black overprinted on the chip side (up to the chip). The reason lies in the selling over other galleries and the references on the supporter companies. The cards supplied by us are excluding the original calling cards without overprint. 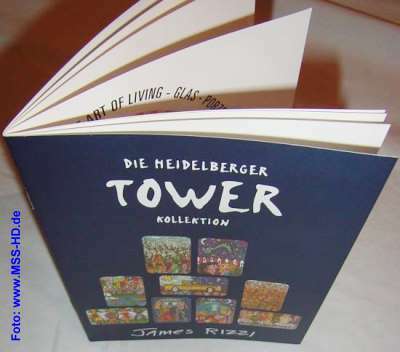 Supplement: information booklet "THE HEIDELBERG TOWER COLLECTION"
Authenticity warranty. Tower and calling cards in perfect condition.